← Michelle Obama presented. So what?! Some days I like to be as simple as possible. This day was no different. 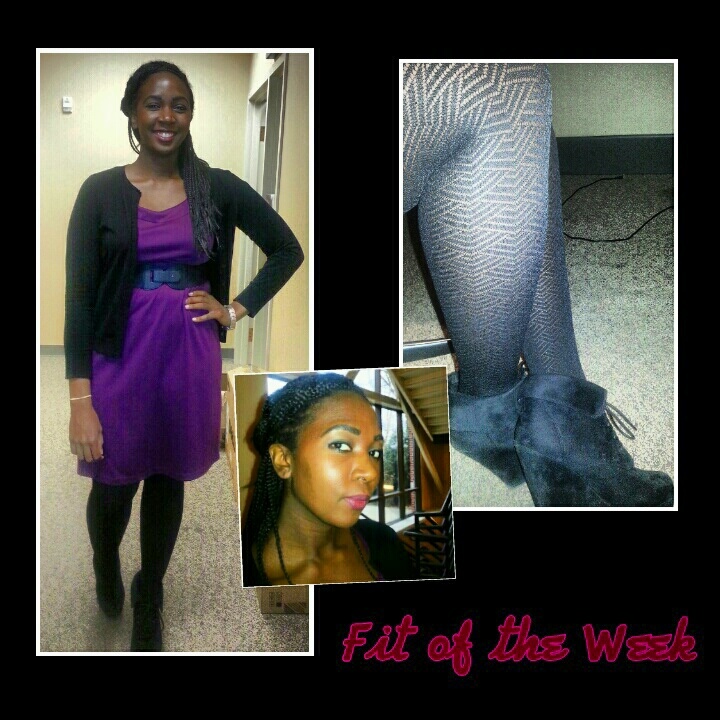 I wore a very plain plum dress, a black cardigan, and black wedges. I wanted to spruce it up just a tad, so I paired this outfit with patterned tights and a thick black belt around the waist. This particular pair of tights is my absolute favorite. I pray nothing ever happens to them because I’m not sure if I’d be able to buy the same pair again. I also wanted to add a bit of color to my face. Below I’m wearing my favorite lipstick, Covergirl’s Euphoria. Posted on Fri.Mar.01.2013, in Fashion and tagged african american, beauty, beauty & fashion, beauty and fashion, black belt, black blogger, black thick belt, Black Tights, Black women, box braids, cardigan, clothing, Covergirl, Covergirl Euphoria, Dillards, dress, earring holes, earrings, fashion, fashion blogger, fashion trend, fashionable, fashionably, fashionista, fit of the week, fow, heavy earrings, lipstick, makeup, ootd, outfit of the day, Patterned tights, plain and simple outfit, plaits, simple, style, style & fashion, style and fashion, target, Tyla times, university mall, waist, wedges, young black woman. Bookmark the permalink. Leave a comment.